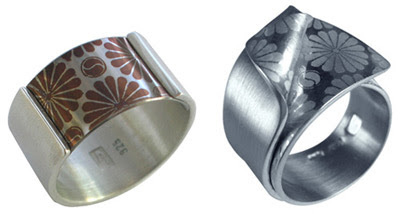 Established in Sydney in 2004 by Rik Juod and Marcelo Zavala-Baeza, Smug Designs is a classy label featuring handmade silver and titanium jewellery and objects. Like many of my favourite Aussie designers, the duo are inspired by nature, and the textiles of Asia. These are hardworking pieces: simple, clean, graphic and designed to outlast trends and fashion. The geometric shapes are modern and cool while still having a feminine touch. I particularly love the rings (pictured above) that remind me of peeling a kimono back to reveal a beautiful chrysanthemum fabric beneath. You can find Smug Desigs at stockists across Australia and New Zealand as well as every Saturday at the Paddington Markets in Sydney. Smug Deisgns also offers custom design commissioned pieces. 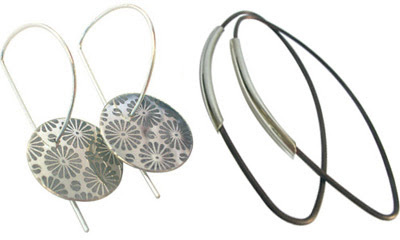 I think my favourite jeweller would still have to be your very own Brisbane-based Kylie Gartside. I have her Fly Away Home ring and keep looking at the earrings. Sigh. Beautiful. I don't have pierced ears but those bangles are awesome!! !